Phillip Island, Australia, February19th 2012: The clock is ticking down in Australia towards the start of the 25th edition of the FIM Superbike World Championship. With 24 permanent riders on the grid and the participation of six manufacturers (Aprilia, BMW, Ducati, Honda, Kawasaki and Suzuki) the 2012 championship is sure to live up to expectations once again this year and with at least ten potential race winners, everything is set for another exciting season of World Superbike racing. As is traditional the production-based racing championship kicks off at Phillip Island (Australia), one of the fastest and most spectacular circuits on the entire calendar. The first of 14 rounds will be preceded by two days of official tests, organized by Infront Motor Sports, on Monday 20 and Tuesday 21 February. This will be the last chance for teams, riders and bikes to go through their final fine-tuning before action gets underway later on in the week. It was one year ago at Phillip Island that Carlos Checa began an extraordinary march towards the first world title in his career. With 15 wins in 26 races the Spanish ace took Italian manufacturer Ducati back to the top slot after a gap of two years. The Althea Racing man was also quickest in last week’s private testing here, confirming his current outstanding form on the Island. “Our Ducati 1198R is six kilos heavier this year with the regulation weight penalty, so we’ve had to modify the bike set-up,” explained Checa. 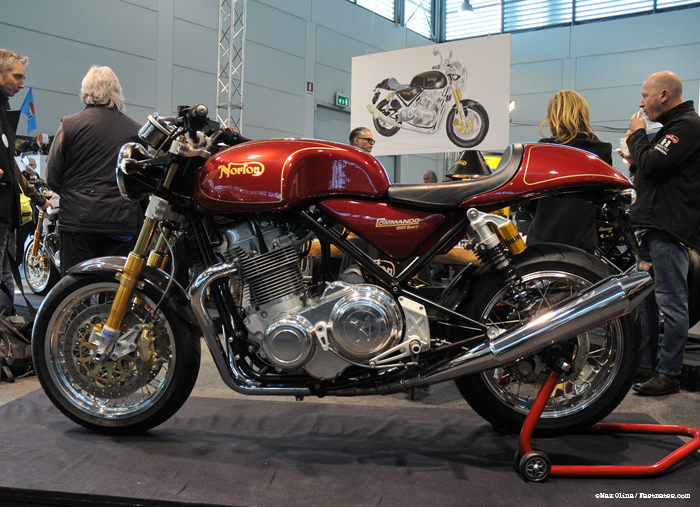 “We also successfully tested some new Ohlins front forks. I’m happy with my lap time of 1 minute 31.8 seconds but now we have to do the most important test, over race distance. Both me and the team are focused on what we have to do, which is to hold on to the world title." Max Biaggi, back in black again this year for the new liveried Aprilia Racing Team, will line up at the age of 40 for his 23rd season of racing with the aim of taking back the number one plate he conquered in 2010. On a difficult track for the Italian bike, Aprilia have made up a lot of ground here in testing, even though “it will be almost impossible to beat Ducati on this track” as Biaggi himself admitted. "I have a new team with me this year and the feeling between us is getting better day after day. We’ve prepared well for the year ahead and we’re ready for battle." The test proved to be a bit of a setback for Aprilia’s new signing Eugene Laverty, who crashed at turn 1, fracturing a bone in his left hand. “It’s a bit painful but with the help of my specialist hopefully I won’t miss the race” said Laverty. “The same thing happened to me a few years ago and five days later I was back on the bike”. The hopes of seeing Crescent Fixi Suzuki star John Hopkins race however are minimal, as the American broke a bone in his right hand and immediately flew to the USA to visit a specialist. Hopkins will probably be replaced by reserve rider Joshua Brookes from Australia, who tested the team’s GSX-R last week. All eyes will also be on the talented rider from Northern Ireland Jonathan Rea, who lines up for another year on a Honda CBR1000RR Fireblade, flanked by Superbike rookie Hiroshi Aoyama from Japan, while the British contingent is completed by Leon Camier (Crescent Fixi Suzuki) and 2011 Supersport champion Chaz Davies, who steps up to World Superbike on an Aprilia together with his ParkinGO team. Australia will also see the start of the 14th season of World Supersport racing reserved for racing bikes from the mid-sized production-based sector. Despite the current economic climate the entry-list is stronger than ever with over 30 riders from 14 different countries, on machines from Honda, Kawasaki, Triumph and Yamaha. In winter testing strong times were recorded by Turkey’s double Supersport champion Kenan Sofuoglu, who has returned to the category to try and win a third title, this time on a Kawasaki DeltaFin Lorenzini. But Supersport, with its elbow-to-elbow racing and late braking moves, is so unpredictable and any number of riders can win. These are sure to include another former champion Fabien Foret (Kawasaki Intermoto), Broc Parkes from Australia (Ten Kate Honda), and Britain’s Sam Lowes, one of six riders spread over three different PTR Honda managed teams, an unprecedented operation in modern-day bike racing. Completing the international line-up in Supersport are two South Africans, two Hungarians, three Russians, two Czechs and a total of eight Italians, all aiming to become the heir to last year’s winner Chaz Davies. 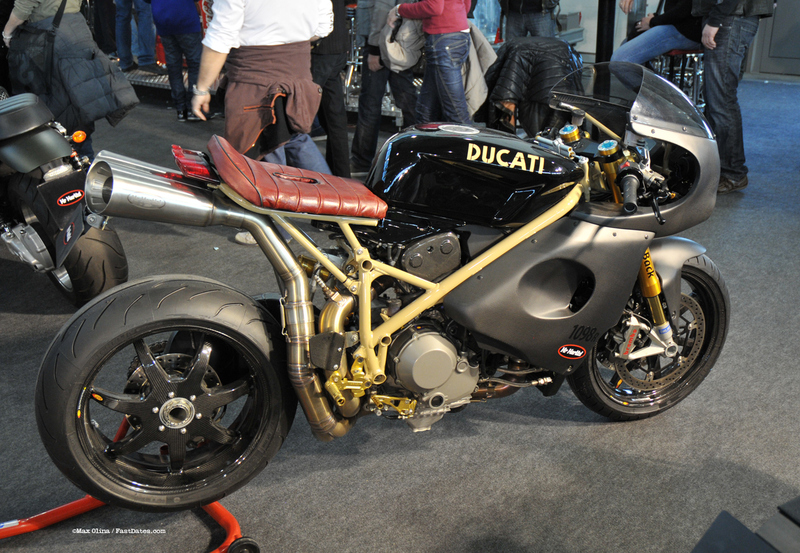 Rome, Italy February 10th - InFront World Superbike has just released it list of team riders and approved homologated motorcycles for the 2012 World Superbike season. Of note is the loss of rider Nori Haga who ws released from the Panta Aprila team, and has just found a ride in the British Superbike Championship with Swan Yamaha. Also of interest is that Ducati has not homologated its new 1199 Panigale to race in European Superstock 1000 as stated they would earlier, with last year's 1000 Superstock Champion Davide Giugliano moving to the Superbike class with Althea teammate and World Champion Carols Checa on the old Ducati 1198RS bike with a newly added 6 kilo / 13.2 lb weight penalty. 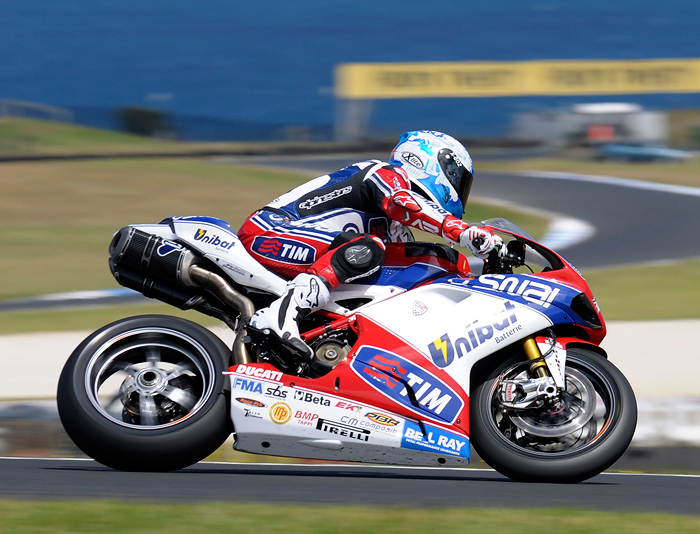 Phillip Island (Australia), Wednesday 15th Feb 2012: The first of two February SBK testing sessions concluded today at the Australian circuit of Phillip Island with extremely positive results for the Althea Racing team. Carlos Checa, 2011 World Champion, recorded the fastest overall times while ‘new-entry’ Davide Giugliano made consistent progress throughout the three-day test. The Althea Racing team got back to work on Monday as these, the first tests of 2012, commenced at the Australian circuit of Phillip Island in warm, sunny conditions. On day one of testing, Carlos Checa immediately set the bar, recording some of the fastest times of the session. His new team-mate for the 2012 racing season, Davide Giugliano, was getting to grips with what is for him a new circuit when he unfortunately took a fall but was unhurt and able to continue with the work schedule. Both riders continued to make good progress into the second day, although Carlos sat out the morning’s session as a result of illness. During the afternoon, the Spaniard and his technicians were able to complete a large part of the planned work and Checa was pleased to find a good solution as far as front suspension is concerned. The times of most riders dropped throughout the day but it was Carlos out in front once more, with a best time of 1m32.1. 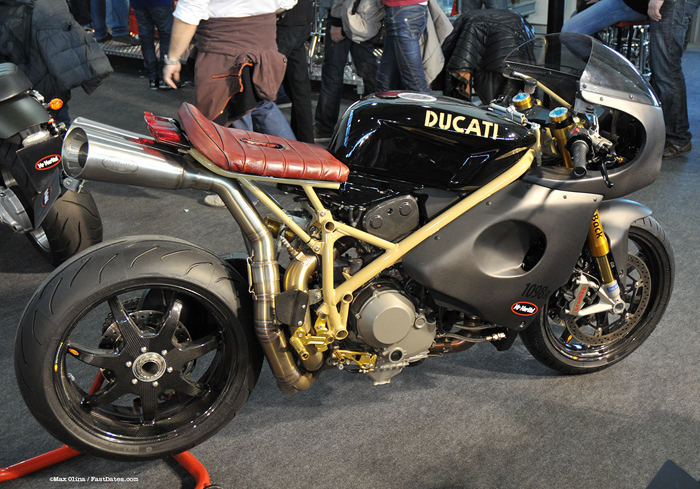 Davide continued to build up confidence with both his Ducati 1198 and the Australian track, recording a best of 1m33.7. Today was the third and final day of testing and, on a track even hotter than yesterday, the Althea riders worked hard until the session’s close. Checa was pleased to be able to repeat yesterday’s performance, putting in a 1m31.8, the fastest lap of the whole session. Giugliano continued to improve; the young Italian worked together with his team to refine the set-up of his Ducati 1198, also finding time to test a new fork. European Supersport 1000 Champion Davide Giuliano (left) moves up to the Superbike class this season with Althea teammate and reigning World Superbike Champion Carlos Checa (right). Genesio Bevilacqua, General Manager of Althea Racing: “Considering that this has been a long and tiring test session, with very high track temperatures, I think we can be satisfied with the results. We were mainly checking the bike’s set up and behavior in light of the extra six kilos. It’s clear that on this track Carlos is able to set some very fast times but this wasn’t our main focus here. We’ve worked hard and I think it has paid off as we have a strong set-up and feel ready for the off. We of course have a significant disadvantage with the extra weight on board, and we’ve already seen here that riders like Laverty, Haslam, Biaggi and Sykes are strong, but we are confident in Carlos’ abilities. Suzuki's new team in World Superbike, replacing Team Alstare, is the British Cresent Team with support from Yoshimura of Japan and Fixi. 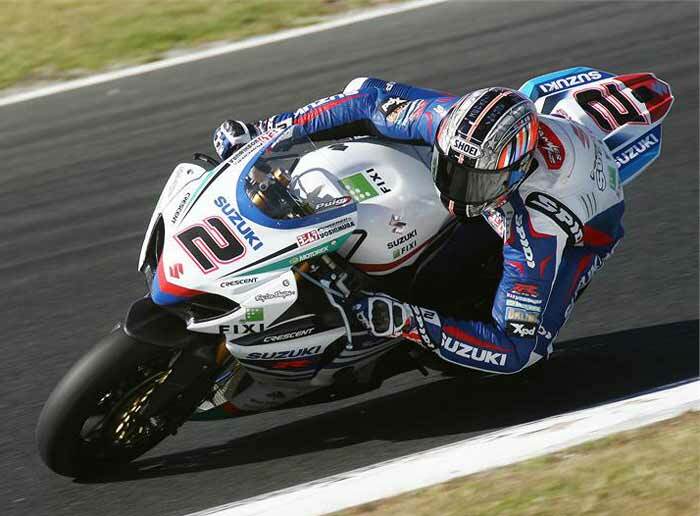 Here is Leon Camier during the Phillip Island tests.. Team Suzuki Press Office, February 17th - John Hopkins has been confirmed a non-starter for next week's opening round of the World Superbike Championship at Phillip Island in Australia but will be back on track at Imola next month. Hopkins, who broke his hand in a high-side crash on the opening day of the Crescent Fixi Suzuki team's three-day practice session at the circuit on Monday the 13th, will be replaced by Josh Brookes on the Yoshimura-powered GSX-R1000 to race alongside Leon Camier, who makes his debut for the team at the event. After flying back home from Australia to California on Tuesday, Hopkins has been undergoing daily treatment under the close-scrutiny of his doctor and is expected to have an operation to repair it next week. Said Crescent Fixi Suzuki Team Manager Jack Valentine: "John's having regular hyperbaric chamber-treatment to get the swelling down before having surgery early next week. Therefore he will definitely miss the opening round here at Phillip Island. But, the good news is that he will be fit for Imola." Josh Brookes joined Leon Camier and the Crescent Fixi Suzuki team for this week's WSB test at Phillip Island in Australia, replacing John Hopkins who crashed and broke his hand on Monday. And it is likely the Tyco Suzuki BSB rider will be stand-in for the American at next week's official WSB test and opening round of the World Championship at the venue if Hopkins is deemed unfit to ride. Both riders ended the three-day test on a positive note after intensive back-to-back testing of the 2011 and new 2012 GSX-R1000s with the team coming away valuable technical data. Leon Camier: "We started these tests with the same bike we used in the Portimao tests last November and then flipped between the 2011 and 2012 bikes on day two. We had a few electrical issues on the second day, but resolved them in time for the last day, which was the first time we've been able to make many changes we wanted to do; and I'm happy because we were able to progress a lot. "There's definitely room for improvement and that is very encouraging. I feel comfortable on the bike and I like the character of the engine a lot. The track temperature has been very hot at times and that affects how the tyres work. This place is all about grip and trying to manage your tyres in a race and you've got to have a good bike set up here if you want to lap fast. "On the final afternoon, we tried a few different things; some worked and some didn't, but it has given us a lot of good information we can use next time out. Generally I am pretty happy. I think we're improving and, for me, the big positive is that I have been able to put in good lap times today and that makes me look forward to the official tests next Monday and Tuesday." Josh Brookes: "It's been more difficult than I thought because the set up of John's bike is very different to what I am used to. It's not easy just rocking up and riding somebody else's bike and I started by trying to use John's settings. They didn't work for me, so we started to make changes and were getting there by the end of the day. I am pretty confident about the front end, but not so happy with the rear yet. That's been the biggest problem today, but all the things we've tried will stand us in good stead in the tests next week." Jack Valentine - Team Manager: "The team had done a massive amount of work before we arrived here, so it was a shame that the tests didn't start well. We knew that we'd have lots to sort out, so losing John so early was a bit of a blow. Leon started with the 2011 suspension and the bike from Portimao and then we gradually introduced new parts. By day three, he was running two 2012-spec bikes and looking pretty comfortable. I'm pleased with the performance of Yoshimura engines and everything is looking very positive. "I am pleased with our work over the three days because we have definitely made progress and are heading in the right direction. Of course, we're a bit behind the game on John's side of the garage, because he didn't get a chance to try out all the new parts, but he's already got a good base-setting and so I don't see any problems when he gets back on the bike. "With John out of action, we decided we wanted a high-calibre rider to help out so we contacted Josh Brookes. Luckily he was able to come down and join us for the third day of the tests. He was an obvious choice - as he rides a GSX-R1000 in BSB and so is part of the Suzuki family. We're grateful to him for coming down at short notice and to Phillip Neil at TAS Suzuki for allowing Josh to join our team." Phillip Island, 15th February 2012 - The time for waiting is over: From 13th to 15th February most of the teams competing in the FIM Superbike World Championship tested at Phillip Island (AUS). It was the first battle on track in 2012 for the teams. During the private test, Team BMW Motorrad Motorsport continued its preparation for the 2012 season after having tested on Spanish soil in Valencia at the end of January. Factory riders, Marco Melandri (ITA) and Leon Haslam (GBR), completed a total of 1,954 kilometres of testing on the 2012 race version of the RR. The weather was mostly sunny and warm. The air temperature reached 32 degrees Celsius, the track temperature 54 degrees Celsius. While during the test in Valencia Team BMW Motorrad Motorsport focused on verifying the latest developments it has made over the winter, in Phillip Island the team worked on the set-up of Leon’s and Marco’s S 1000 RRs. The crews worked on several chassis set-ups mainly in order to achieve performance and consistency. On top of this, the team worked on the engine management, setting up torque delivery and engine brake for the characteristics of the Phillip Island circuit. The team has drawn a positive conclusion from the test. Both crews were able to evaluate important set-up changes that are not possible to be tested over the course of a race weekend. On the chassis side, the team found a rear end set-up that it will use for the race. Leon has already achieved a quite stable base set-up. During the official Infront test on Monday and Tuesday he will focus on race performance and do the fine tuning. Marco is still investigating the complete range of setting up the RR before concentrating on race performance. The team’s technicians will now evaluate the data collected over the last three days and prepare for the official Infront test. Marco gets fitted to his new BMW for the first time. It looks like many of his mechanics followed him over from the Yamaha team. Feb 20th - Riders Jonathan Rea and Hiroshi Aoyama will use the two-day test to follow up on the work carried out during a private test held at the same circuit last month in preparation for next weekend’s (24-26 February) opening round of the 2012 World Superbike championship. The InFront test will be the first opportunity for the team to run in its new livery, which is based heavily on one of the colour schemes of the new 2012 Honda CBR1000RR Fireblade. Los Angeles, Feb 10th, 2012 - The 2012 Calendar Bike Show continues its now 21-year tradition as the premier outdoor streetbike event in America with top Celebrity Builders, the upscale Calendar Bike Building Championship & Concours d' Elegance, selected Vendors and Exhibitors, Calendar Girl Music live performances. 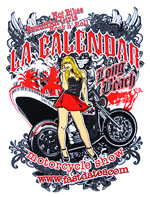 As always the Show marks the world premier of next year's new 2013 FastDates.com Motorcycle PinUp Calendars featuring the world's top roadrace and custom motorcycles with the beautiful Calendar Kittens also featured at the Show. New Calendar Kitten Liz Leyda tells us about her first time experience..... shooting for the FastDates.com Calendars! NEW YORK, NY, February 14, 2012 – Florida model Kate Upton sizzles in Sydney on the cover of SPORTS ILLUSTRATED SWIMSUIT 2012, out February 14 on newsstands, tablet, mobile and SI.com/Swimsuit. The red-hot cover shot was captured by legendary SI photographer Walter Iooss Jr., his 12th Swimsuit cover. The 19-year-old, Melbourne, Fla., native joins an elite group of women who’ve appeared on the coveted cover, including Kathy Ireland, Christie Brinkley, Cheryl Tiegs, Heidi Klum, Elle MacPherson, Tyra Banks and Brooklyn Decker. Swimsuit 2012 content extends far beyond the pages of the issue, with digital extensions of SI Swimsuit including a supercharged tablet edition that features more than 150 photos and 2 hours of video, available for iPad, Samsung Galaxy Tab, Barnes & Noble Nook Color, Amazon Kindle Fire, Motorola Xoom and Android smartphones. There is also an iPhone app that gives users a 360? view of bodypainted athletes and SI.com/Swimsuit with an interactive music section and first-ever Swimsuit style guide. Upton, in her second Swimsuit appearance, is joined by 2009 cover model Bar Refaeli – photographed with Rafael Nadal, Chris Paul and Michael Phelps – and 2011 cover model Irina Shayk making her sixth appearance in Swimsuit. Also returning to Swimsuit are Cintia Dicker (4 appearances), Jessica Gomes (5), Izabel Goulart (2), Julie Henderson (6), Ariel Meredith (2), Alyssa Miller (2), Genevieve Morton (3), Chrissy Teigen (3) and Anne V (8). The six 2012 Rookies are Adaora, Nina Agdal, Kirby Griffin, Crystal Renn, Michelle Vawer and Jessica Perez, winner of the 2011 Rookie Model Search. The issue also features a first-ever pairing of two SI Swimsuit traditions — bodypainted athletes. U.S. Soccer star Alex Morgan, the LPGA’s Natalie Gulbis and U.S. swimmer and 11-time US Olympic medal winner Natalie Coughlin’s bodies were the canvases for athletically inspired suits. Got your hearts on? Click for a date with Kate! They feature wesome color photography of the riders, bike and racing action. The feature a deailed revue of the past season in pictures and stactics, awith a detailed look at the bikes and riders. Munich, 19th February 2012. 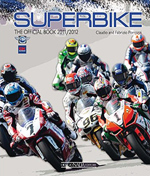 Green light for the 2012 FIM Superbike World Championship: the new season will officially get underway in the upcoming week. Phillip Island (AUS), close to Melbourne, will host the first two races on 26th February. Before then, Team BMW Motorrad Motorsport will take part in the official Infront tests, which are held in Phillip Island on 20th and 21st February. Last week the team completed a private, three-day test at the same venue. Britain’s Leon Haslam will contest his second season as a BMW Motorrad factory rider in 2012. 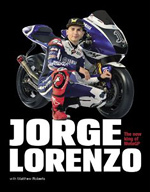 Last year he scored 224 points on his number 91 BMW S 1000 RR, finishing fifth in the Riders’ Championship. His new team-mate is Italian Marco Melandri, who lines up in his second year in the FIM Superbike World Championship and his first season for Team BMW Motorrad Motorsport. Melandri celebrated four victories in his debut season, ending 2011 as runner-up in the Riders’ Championship. The Italian’s RR will bear the start number 33. Team BMW Motorrad Motorsport enters its fourth season in the FIM Superbike World Championship, and the team has set itself some clear goals: to close the gap to the top teams and challenge for the title. The 2012 race version of the RR has been the subject of comprehensive further development. 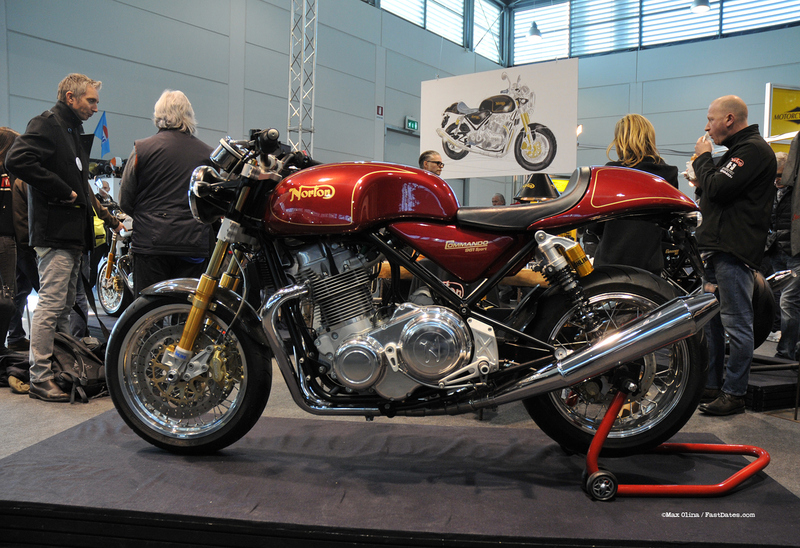 Brought in line with the new production version of the bike, it features improvements to the aerodynamics and chassis. The team has also optimised the BMW electronics. With the new one-bike rule coming into force this season, the bike has also been made easier to service. Since the start of the year, the team has had a new Head of Race Operations, in the form of Andrea Dosoli (ITA). The rest of the management structure around BMW Motorrad Motorsport Director Bernhard Gobmeier remains unchanged: Stephan Fischer is Head of Development, while Josef Hofmann, the Managing Director of alpha Racing, assumes responsibility for the Stephanskirchen factory. 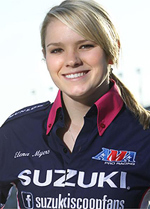 Team Suzuki Press Office - February 14 - Elena Myers has signed with Team Hammer for the 2012 AMA Pro SuperSport Championship with title-sponsorship from American Suzuki's SuzukiScoopFans page on Facebook and SportbikeTrackGear.com. Said Myers: "I'm really excited to be back with Team Hammer and all of our Partners this year. There's no question that we have an excellent program and we're looking forward to continuing the relationships we've built. The GSX-R600 will be fast and it will look great."?? Now 18, Myers burst onto the AMA Pro scene as a 16-year-old rookie in 2010, becoming the first woman to win an AMA Pro sprint race with a victory at Infineon Raceway. She finished as the SuperSport West Region Championship runner-up in 2010 while impressing with her balance of measured tactics and well-timed aggression.?? Myers, from Discovery Bay, California, finished fifth in the 2011 AMA Pro SuperSport West Region Championship with a combined five top-five finishes across both regions, including a podium-finish at Barber Motorsports Park.?? Said Myers: "The past few years I've had a lot of expectations about wanting to win a Championship and I think we've continued to develop towards that goal. I've got great backing and if I can stay healthy, we'll go hammer-down. This will be my third year in AMA Pro SuperSport. I've been working on an intense training program this off-season and I'm really looking forward to getting to Daytona. There are more rounds this year and I am certainly happy about that too."?? 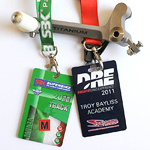 Myers will race a 2012 Suzuki GSX-R600 and Eric Gray will lead her crew with assistance from returning mechanic Phillip Doyle.?? Said Gray: "An opportunity to work with Elena is really exciting for me. She's a previous winner and a proven front-runner. Working with a different rider in the team last year, I got to see her approach to racing and saw that she has an exceptional work ethic. She's entering her third year so she has some experience even though she's still at a young age. 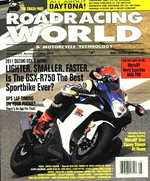 The team learned a lot about the Suzuki GSX-R600 last year and we have a good base-line setting."?? Team Hammer General Manager Keith Perry said: "We're excited to continue her development with the team and see where that takes her. The team felt she learned a lot in the second-half of the 2011 season and she sharpened her skills with each race and especially at the CCS races we ran last fall. "Elena has a lot of promise and clearly she has a lot of natural talent and ability and we're committed to helping her continue to improve. We will have Eric Gray working with her this year and he has a good record with young riders, so we are all excited." Said Brian Van of SportbikeTrackGear.com: "We are very proud to be supporting Elena Myers and working with the SuzukiScoopFans program and Team Hammer in 2012. Elena is a real talent as I discovered first-hand when she passed me like a mailbox on the roadside in AMA Supersport Practice at Barber in 2011; 2012 is going to be a great year for sure!" 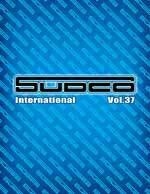 American Suzuki's Chief Pat Alexander added: "Suzuki is happy to be working with one of the fastest women on the planet in Elena Myers. It's good to have her representing American Suzuki and SuzukiScoopFans. She's worked with us for a few years and she's done well by winning at Infineon Raceway in 2010 and fighting through injury to produce good results last year. Elena is a good ambassador for our brand and she has all the potential to come out on top for the 2012 season."